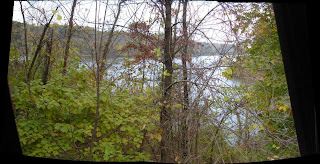 Leaving Dillon State Park, we see the forecast is for some rather cold weather. The plan forms for some mileage and a "left" turn towards the south. 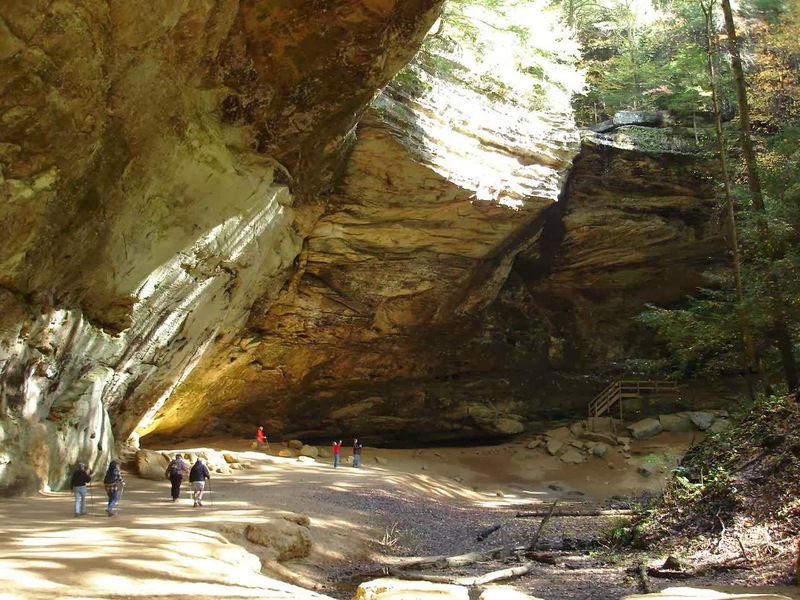 Meanwhile, still in Ohio, we head for a well known and locally favorite state park, Hocking Hills. 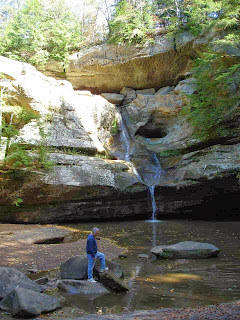 One of the reasons for its popularity is the location next door to a group of caves featuring the Old Man's Cave. This picture, and some others to follow, are from an earlier visit in 2007. Be ready to climb up and down some steep trails, but the effort has rewards. This is the Old Man's Cave. Besides the caves, there are also some waterfalls along your hike. The color at Hocking Hills can be quite intense, but not so much this year. 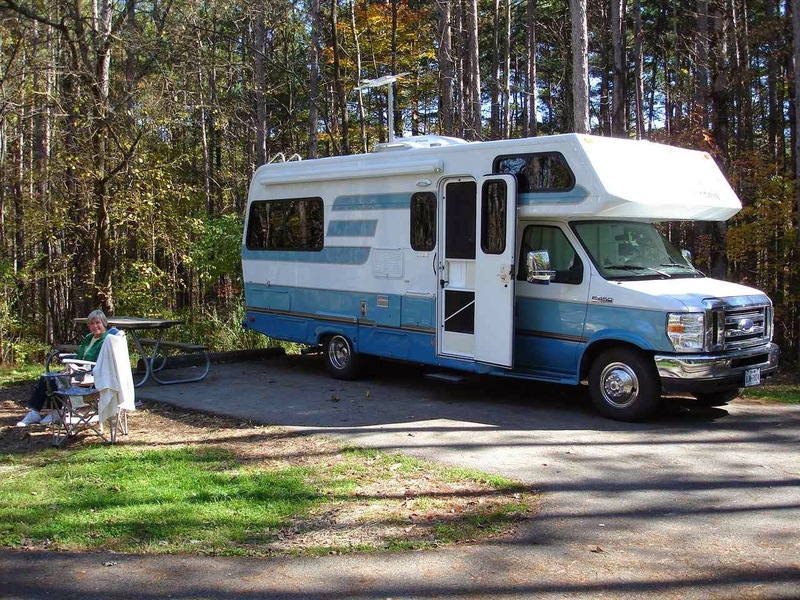 This picture is from 2007 of our old 5th wheel and truck. We seem to arrive at Hocking Hills during the Halloween season. 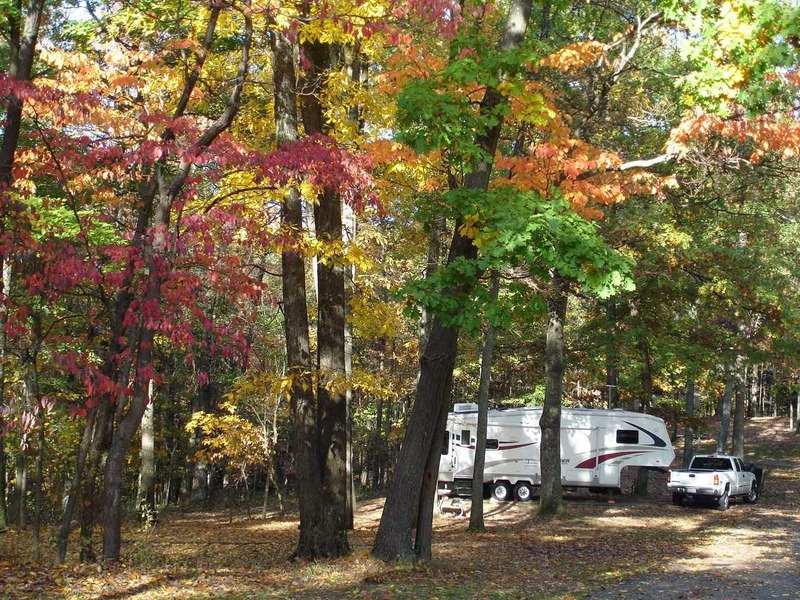 I say Halloween season because the campground fills up for a whole week. 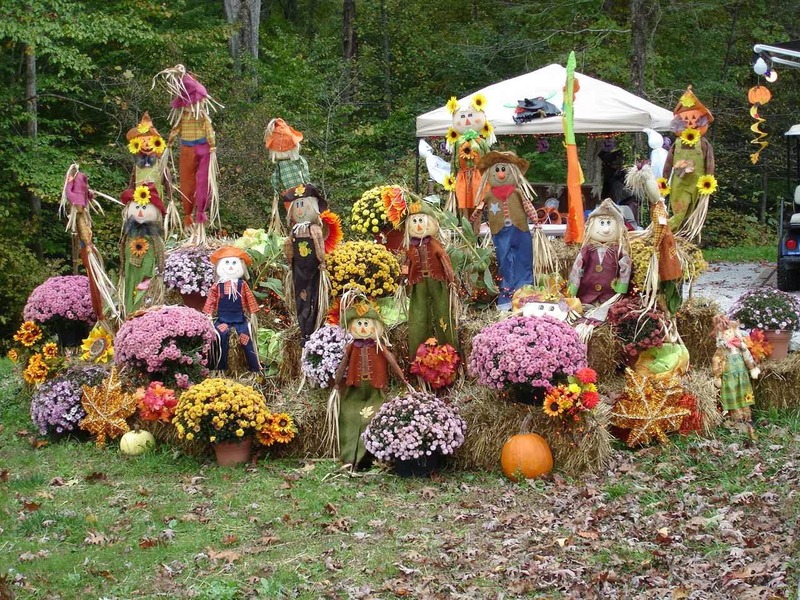 This allows the local campers to set up their sites and also all of their decorations. Halloween is big at some campgrounds. 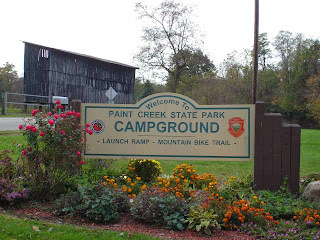 So off we go to Paint Creek State park. One of our favorites. This is the view from our back window this year. 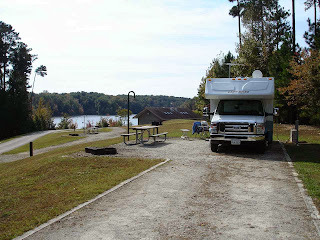 A very quiet campground, lots of open spaces, and each site is large and well separated from others. This picture of Jan is from the nicest site in the park( we think), number 116, that we were able to have in 2007. 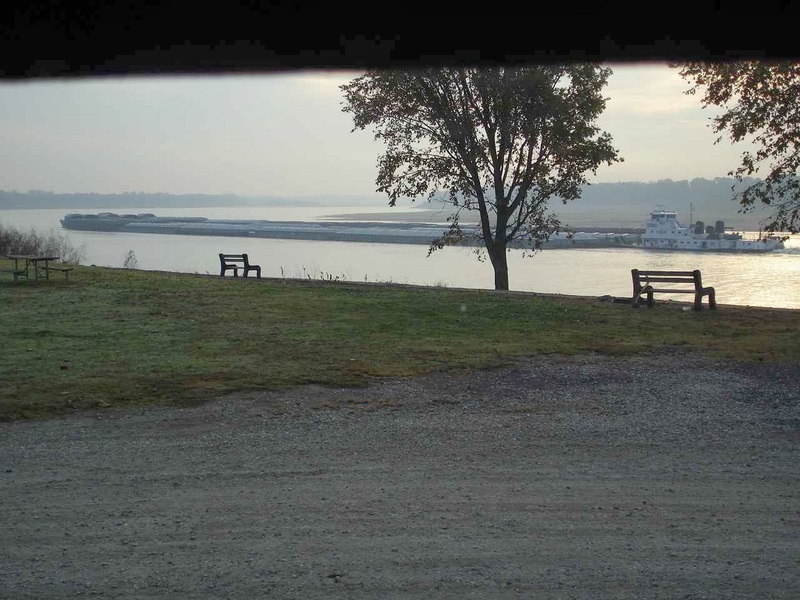 This view is from the deck ---on our site! While Hocking Hills is listed as perhaps Ohio's most popular state park, we vote for Paint Creek. Of course, we prefer the quieter parks with more separation between sites. We find that people seem to either love Halloween or definitely not. 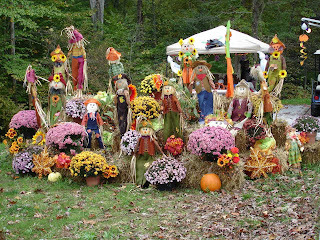 This is typical of some of the campers who love to decorate and celebrate for Halloween. We try to imagine how they even managed to get all of these decorations to the park. We think, maybe, they all live fairly close by. This was at Levi Jackson in London , Kentucky. 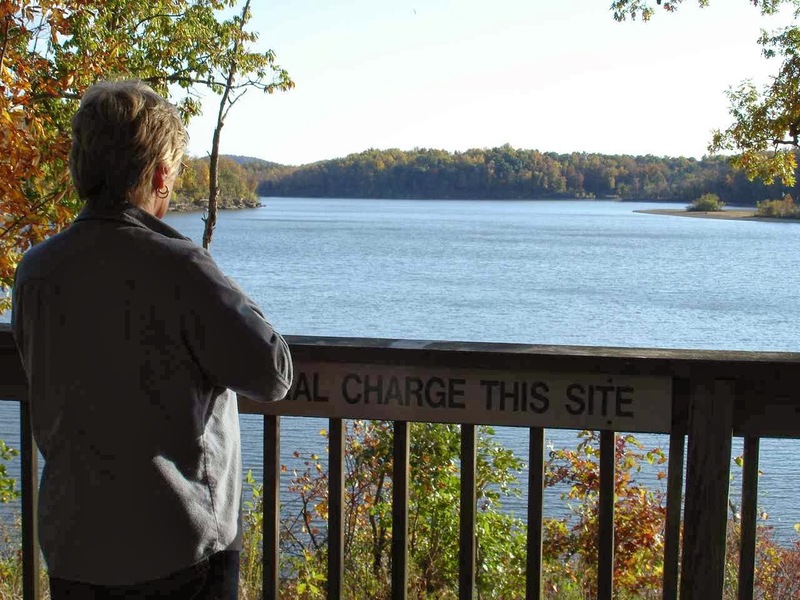 It is a state park that is reviewed with 10's and 9's, but not our numbers. We stayed one night. 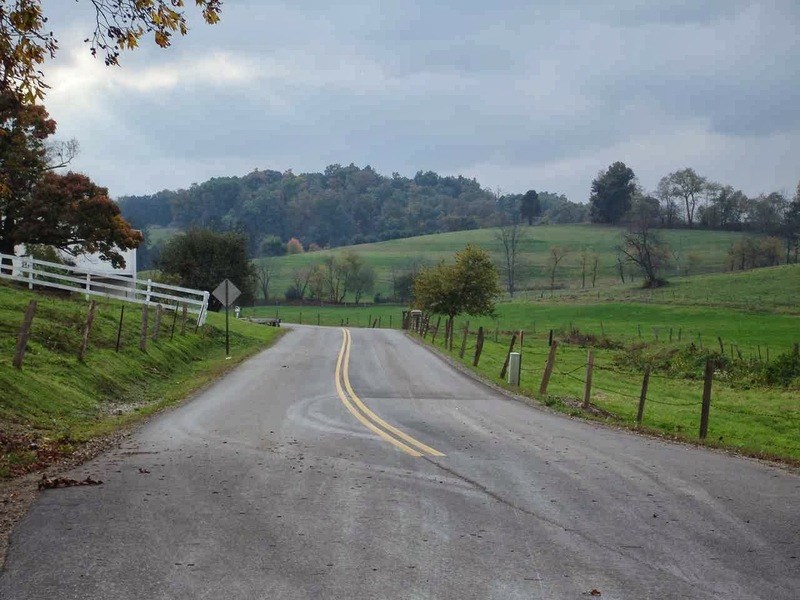 One of the nice things about driving from Kentucky southwest into Tennessee is the beautiful rural views along the way. 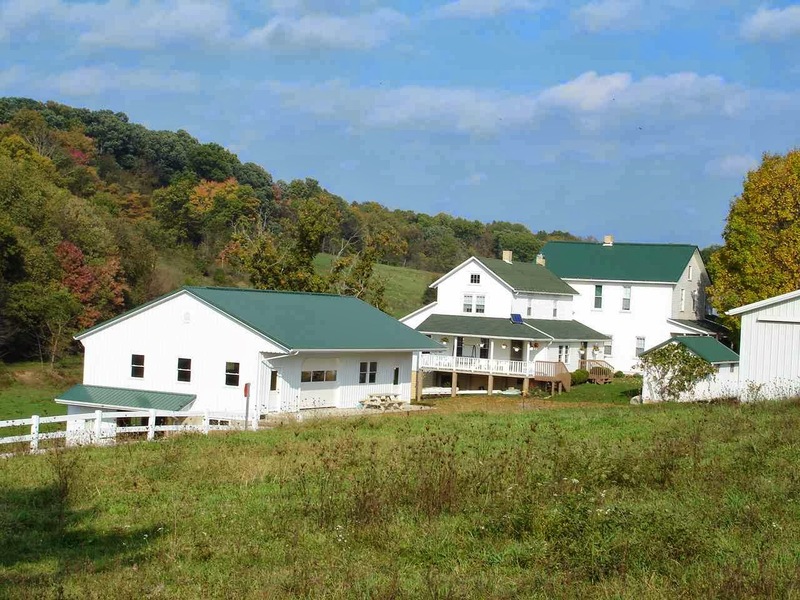 There are some wonderful Amish farms and horse farms along the back roads. Sometimes, we had the whole road to ourselves for quite a while. 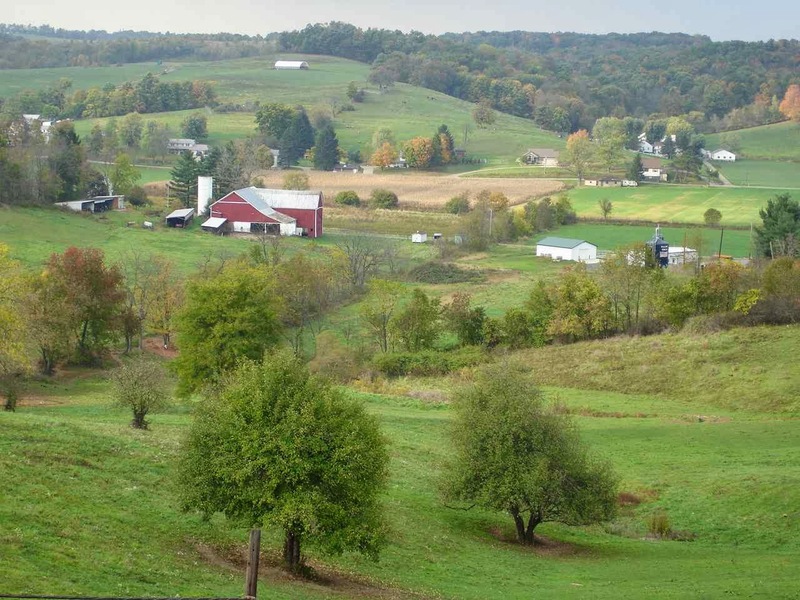 This is actually a picture from Ohio's Amish country. Just had to include it here. 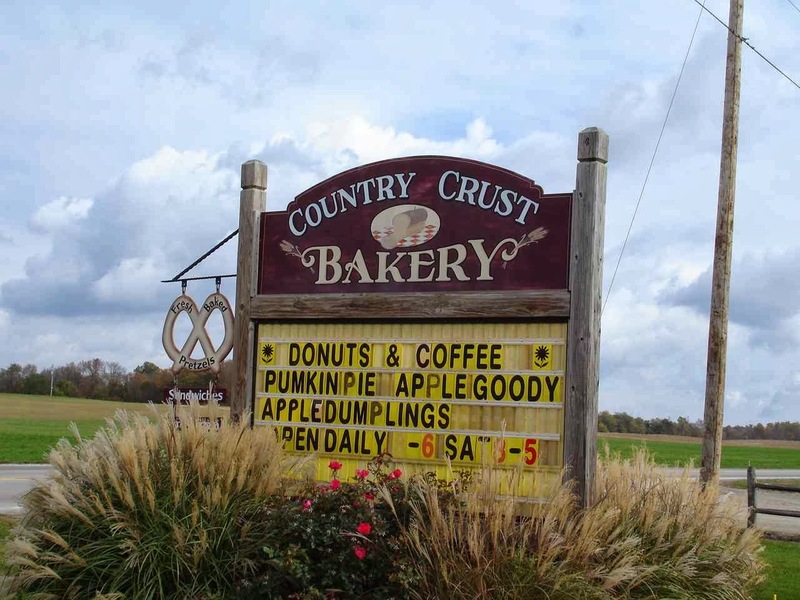 Coming up over the top of a hill in Amish country and there is a sign for a bakery. Nothing but farms all around. A large bakery, filled with breads and fry pies and pies ------lot of them. In the store are at least 8 or 9 Amish girls and women working at baking and packing and selling. We found a number of fruit fry pies , a donut, and a wonderful, fresh loaf of bread. From Kentucky into Tennessee, we quite often see these barns along the way. 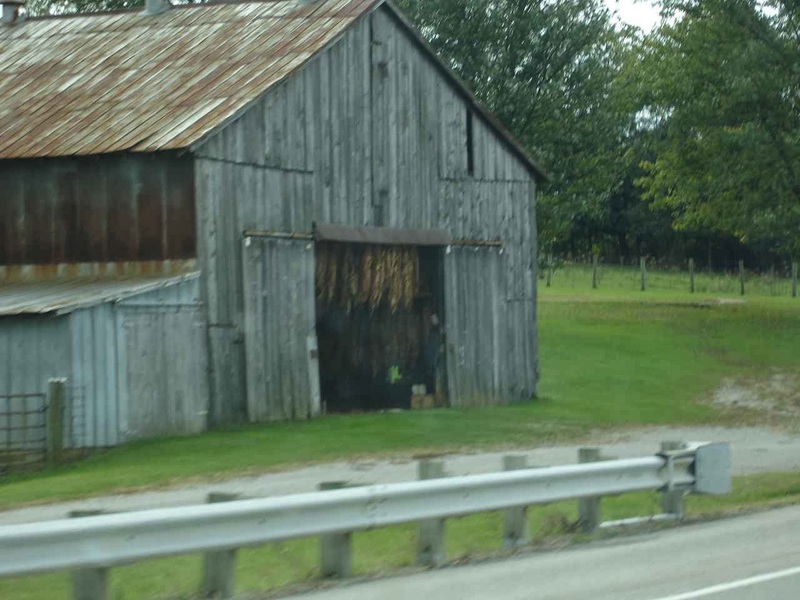 The doors--sometimes quite a few on the barn--are open to air out the tobacco which you see hanging. 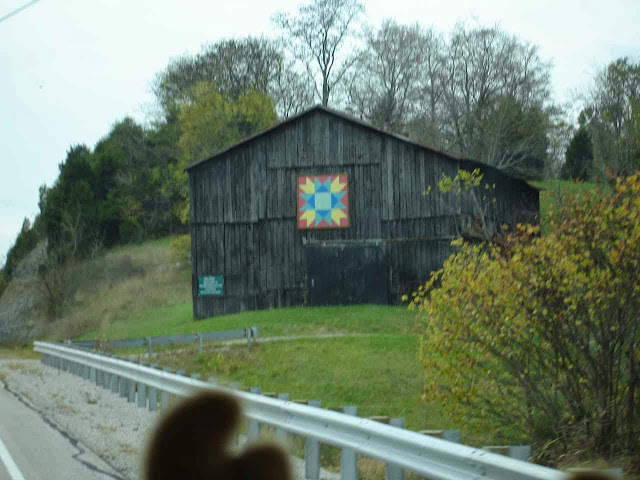 Sometimes you will see the barns, decorated with hex signs. Also , you might see freshly painted barn sides with a big sign for Mailpouch Tobacco. 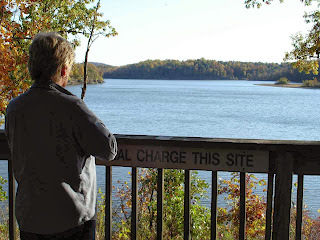 We had a chance in 2012 to look at this beautiful state park in Tennessee called Natchez Trace State Park. This year we stopped by and found ourselves a good spot with a wonderful view. 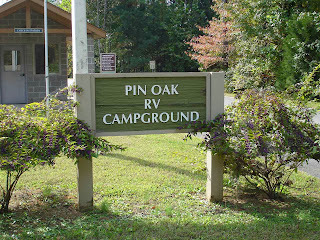 Pin Oak is one the campgrounds within the Natchez Trace State park. We could say that it is right off Route 40. 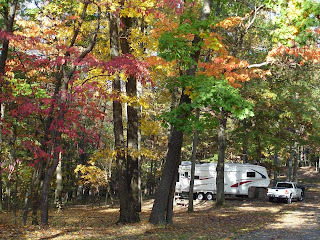 The state park does start right off Route 40, but you must drive about 14 miles within the park just to get to the campground---well worth it. Each site is large clean and very flat. They have imported some fine white sand for the beach area. Also at this area is a large new style playground and picnic shelter. 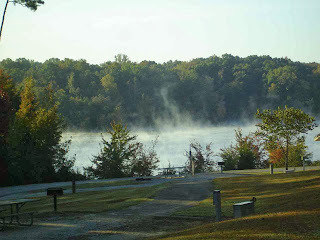 From our back window on one of the below freezing mornings, it was a wonderful sight to see the "smoke on the water". What was hard to understand was that this was a weekend. And there were no fishermen at the lake??? I did talk to some locals in the campground and at our oil change stop. They indicated that there was good fishing here. 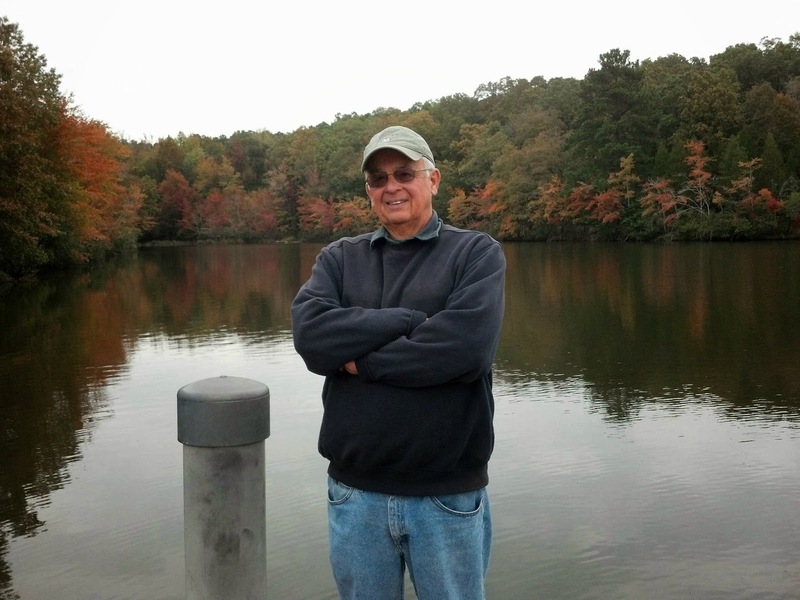 But, there are many other larger lakes to fish. By talking with a number of locals, we found our way to Lexington and then to Jackson, Tennessee to a place called Best One Tire. Not sure why it was so difficult, we stopped at several places including a Ford dealership, but people were friendly and the manager at Best One was great. Lady Blue was well taken care of with an oil change, rotated front tires, new air filter, and a new oil filter. Route 40 right off of exit 79 if you are in the area. The view out our back window this morning . This is at another of our favorite private campgrounds. 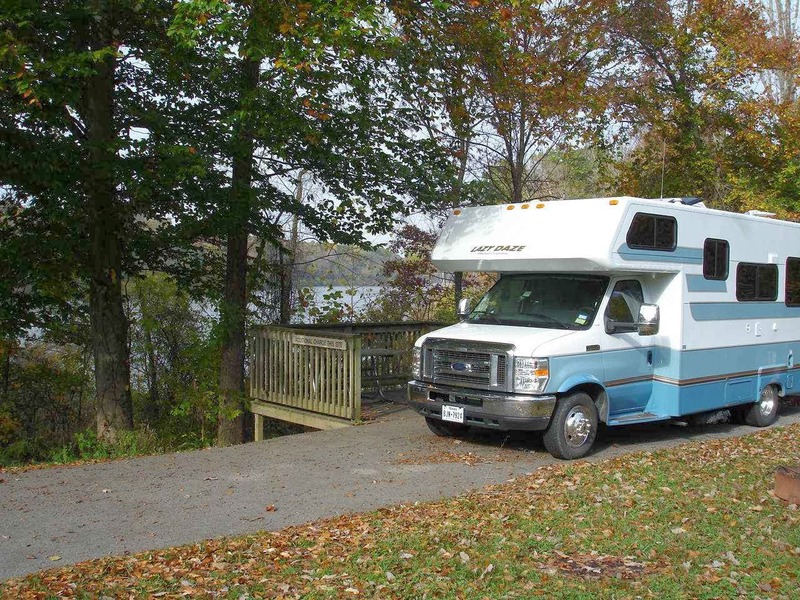 We are heading to some camping at Corps of Engineer and state parks in Arkansas, but this is always a fun stop. The campground is Tom Sawyer in West Memphis, Arkansas. Across the river and to the left (north) is Memphis, Tennessee. 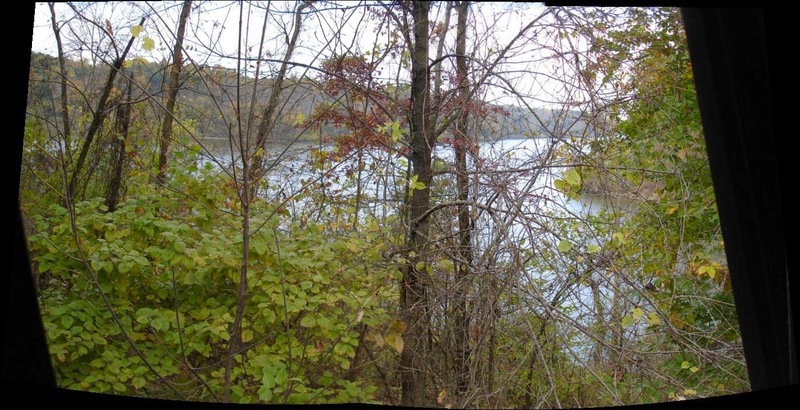 Across the river and not too far to the right(south) is Mississippi. This tug is pushing about 30 barges , all tied together. 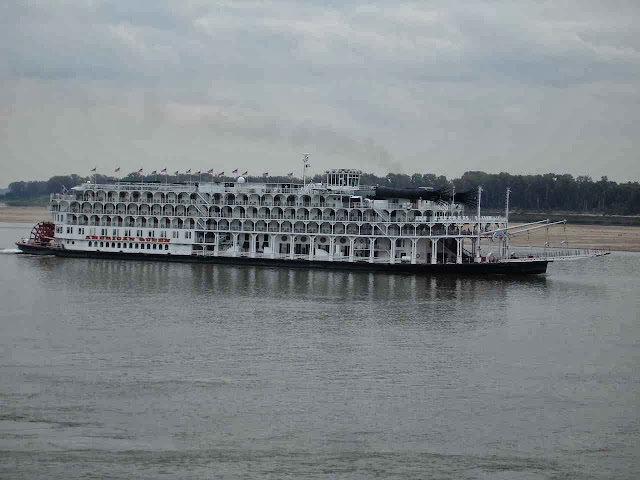 The larger ones are 5 across and about 6 barges long. 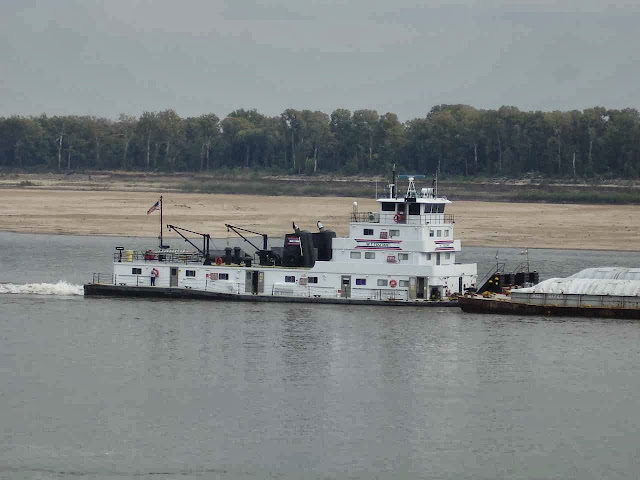 This is a typical larger tugboat. The exhaust stacks would seem to indicate two good sized diesel motors. To get an idea of how large these are --note the man standing just to the right of the window towards the stern. The river is low this year, but still higher than it was last winter when they had to limit the traffic on the river. Some of you remember when we had to leave this campground because of imminent flooding a few years ago. There is a building in the campground with a large sign about 20 plus feet off the ground marking the high water mark in 2011. This is the first time that we have seen a large paddle wheel boat on the Mississippi River. You will note that the fake smokestacks in the front section are laying down to get under the bridges. Under the arches , if you enlarge the picture, you can see the rooms for the passengers. Some are sitting outside , under the arches. These boats will stop at plantations and other spots along the river. The front section can be lowered to the beach or they can pull up to a dock. This seems similar to some of the barge or river trips that you can arrange while traveling in Europe. Belfast, Maine to Wales, Mass.